For native English speakers, filling out the free application for federal student aid form, commonly known as FAFSA, can be confusing. For non-native English speakers, it’s even harder. “We know that the parents in our Bronx community may have some difficulty completing FAFSA applications—both because it’s something new for them, and also because the forms are all in English, and they may not able to understand what it is that they have to enter,” said Eva Garcia, executive director of the New York City Regional Bilingual Education Resource Network (RBE-RN) at Fordham. Khaled Saleh with his son, Abdulsalam Saleh. The younger Saleh plans on applying to public schools in the five boroughs, including the John Jay College of Criminal Justice. Over the past two months, local high school seniors and their parents have been coming to the Rose Hill campus to get help navigating the tricky paperwork that accompanies college applications. In the second annual series of four workshops hosted by RBE-RN—a state-funded center at Fordham’s Graduate School of Education—and College Goal New York, volunteers have sat down with families to pore over the complex forms and help them eliminate hurdles that might otherwise stop them from applying to college or prevent them from continuing once they’ve started. “This partnership is driven by the need to address the high incidence of dropouts among English-language learners in high school,” said James Rodriguez, retired teacher and coordinator at College Goal New York, which aims to increase FAFSA completion rates, particularly for low-income, first-generation families. The Bronx is a borough filled with non-native English speakers and an array of languages: Spanish, French, Bengali, Russian, Italian, Albanian, the Ghanaian language of Twi, and Kru—a language spoken by people from Côte d’Ivoire and Liberia. But for families whose first language is not English, filling out FAFSA forms can be challenging. One of the families that attended the workshop was a mother-daughter duo: Maria Ponce, a native of Mexico, and Kenny Herrera, a high school senior at Knowledge and Power Preparatory Academy—a three-minute walk from the Rose Hill campus. When Ponce arrived at a workshop held on Nov. 3 in Hughes Hall, she was clueless about what would come next. But after attending the 20-minute info session—an orientation given entirely in Spanish by Hispanic Federation members—she said she realized the paperwork process wasn’t so difficult after all. Completing the FAFSA application itself took 10 to 15 minutes, Herrera estimated. “Fue difícil Mami la aplicación?” Herrera asked her mother in Spanish. Was the application difficult? 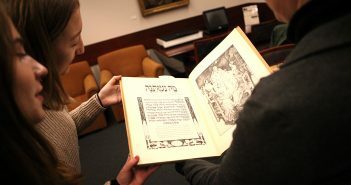 The families filled out the online forms in Hughes Hall’s first-floor trading room, packed with more than 40 computer terminals used by students in the Gabelli School of Business. 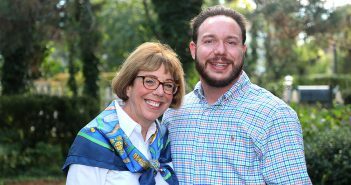 If the families encountered a problem, there were plenty of people to help them: local high school guidance counselors and volunteers from financial aid departments at nearby colleges, which included Fordham students and alumni. 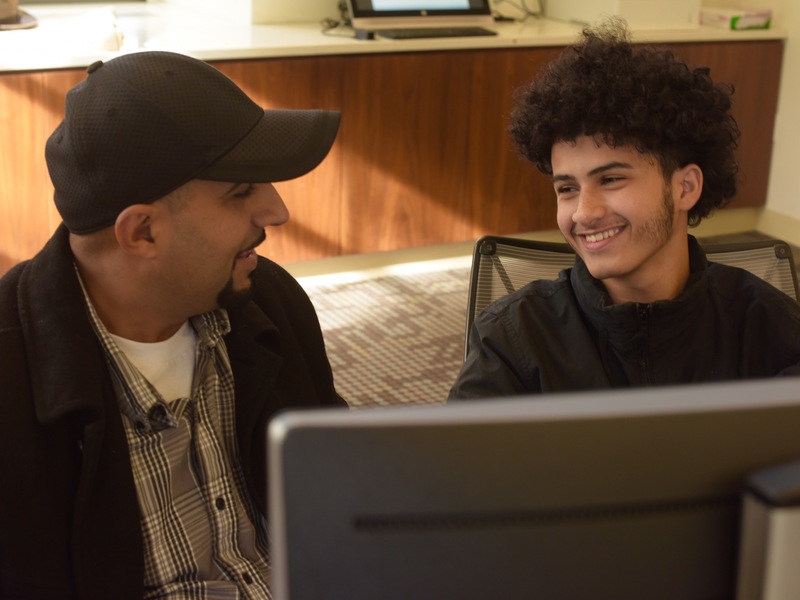 “Every time you get stuck with a question, you can ask them and they help you,” said Khaled Saleh, who came to the Nov. 10 workshop with his son Abdulsalam. Johanna Gomez, a financial aid counselor, assists a mother and her two daughters. 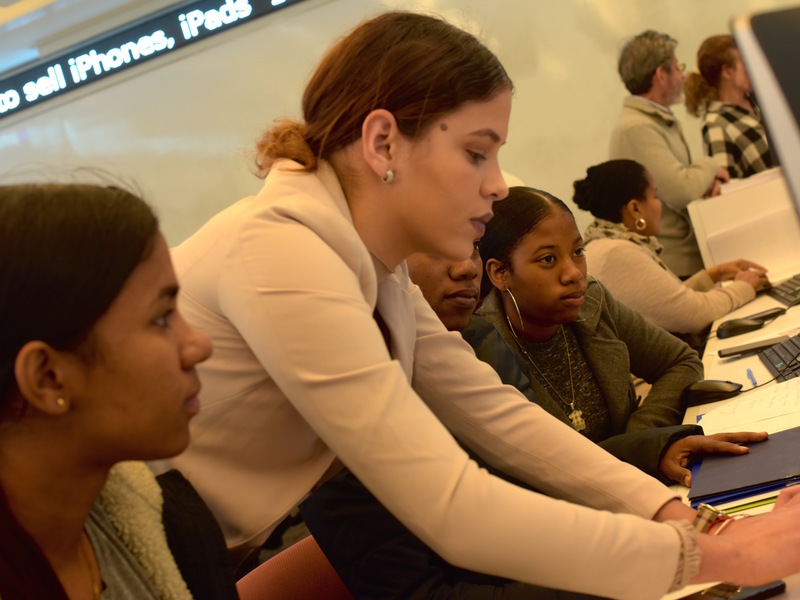 Alyson Weaver, FCRH ’05, GSS ’13, a workshop volunteer and high school social worker in the Bronx, described the workshops as a “one-stop shop” where families could inquire about how to create the FAFSA accounts, read their tax returns, and decipher the application process. “There’s an expert or someone who’s really knowledgeable that can help navigate the process for them, and reduce some of the stress and anxiety behind filling out these forms,” she said. The parents who come to these workshops are often quiet, humble, and a little fearful, Garcia said.